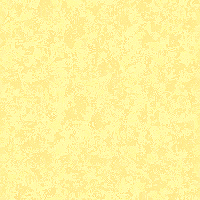 by the might of my power and the magnificence of my splendour?" 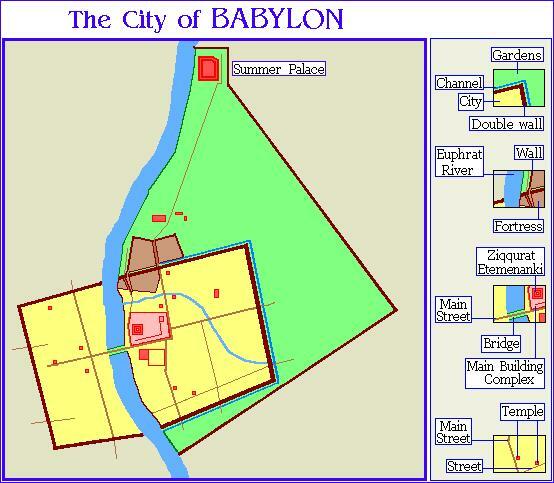 Babylon was the most important city of history, so much that no other city, not even Rome, had the same glory. Babylon is the head of the empires. Only Nineveh was so great before her destruction. Babylon was not destroyed but abandoned, and even the Euphrates changed course withdrawing several kilometres from the ancient city. That is why Babylon will not exist never again, but only the ruins of the passed splendour will witness what the city once was. Even though somebody may attempt to rebuild Babylon, that will not be Babylon, not in the original place, and never with the original power and glory. Nevertheless, this city has left her heritage and is present in modern civilization, very present... Babylon is in the heart of any great city, in the soul of commerce and entertainment, of lust and vanity; Babylon is the soul of globalization, the first city that was built to rule over the whole mankind. 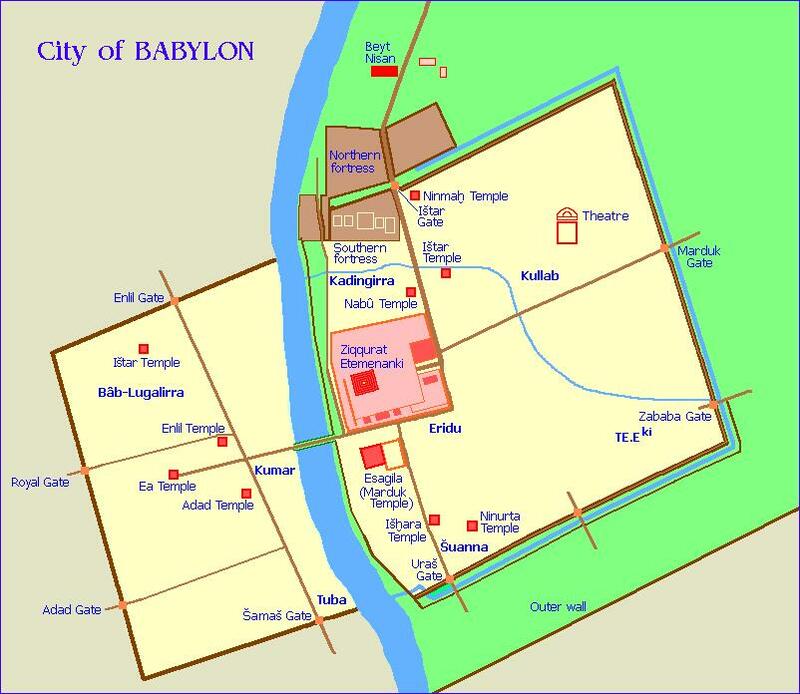 The city of Babylon, "BAB-ILANI" in Chaldean language –Aramaic–, was built on both sides of the Euphrates having each side a trapezium shape. The centre of the city was in the eastern side, protected by double walls and a channel by the outer side of the walls, and a single wall by the Euphrates. A bridge led to the western side, that was also protected by a double wall, except by the river shore. Surrounding the eastern side, there was a peripheral zone roughly triangle-shaped also protected by walls; this was mainly a green area of parks and gardens, with some royal palaces where the kings used to have their celebrations and parties. The Beyt-Nisanu -"House of the New Year"- to celebrate the new year, and the Summer Palace where the king used to be in times of peace during the Summertime. The city was accessible through ten gates, four of them in the western side (see maps below). Such a city was inexpugnable, and to take Babylon would have been an almost impossible undertaking. The king Nebukhadnetzar made of Babylon the capital of the world. He was a wise king, and even though he conquered many nations with his army, he was not unkind towards the surrendered peoples. He destroyed Yerushalaym because the Israelites of the Kingdom of Judah rebelled against him many times, but he appointed a Jew as his main counsellor who was second only to him in the kingdom, the Prophet Daniel. The Jews were in exile in Babylon, but they were also allowed to become a wealthy people, so much that when the permission to return back to Zion was given, most Jews chose to remain in Babylon. Notwithstanding, the kings that succeeded Nebukhadnetzar were not as wise as he was. His son Avilmardukh took the throne after him but was murdered after two years and one of his army generals took the kingdom. Other two kings reigned in a short period, until Nabuna'id achieved stability again. But Nabuna'id retired himself in Arabia and settled his residence in Teyma, leaving his son Belshatzar to rule in Babylon. Belshatzar was fond of parties and licentious behaviour; Babylon was so powerful and safe that he did not imagine the fall of his empire. On Tishrey 16th of the year 3222, Ugbaru, general of Kurush the king of Persia, entered Babylon without battle, while the king was in Teyma and the crown prince was drunken after a party. In this way the great invincible city was taken, and her empire ended. an astonishment and a hissing, without inhabitant. neither does son of man pass by it."